Russian team vs the World tournament to take place 8–11 September in the State Kremlin Palace featuring Viswanathan Anand, Garry Kasparov, Peter Leko, Vladimir Kramnik, Nigel Short, Anatoly Karpov, Judit Polgar, Yevgeny Bareev, Teimur Rajabov and other great chess players. The site employs the chess board pattern. 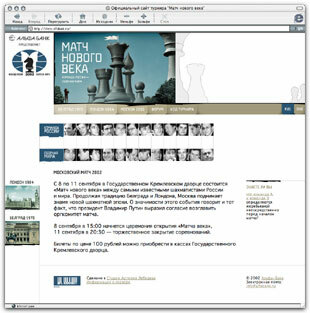 Visitors to the website can learn about the Match of the New Century and read the history of chess competitions. The server also allows to follow the tournament online. Art. Lebedev Studio would like to thank the 64 magazine staff and A. Roshal and V. Dvorkovich personally. Raymond Keene, David Goodman, John Groser Docklands Encounter. USSR vs The World, New-York, 1984.